As I write, the temperature outside is down to zero, and there is a light dusting of snow on Garway Hill where I live. But already there are signs of the little wild daffodils which grow in our wood starting to push their pale green shoots up through the dark, wet soil, and by the time you read this at the beginning of March, flower buds will be forming and it won't be long before they are fluttering their lovely cream and yellow flowers in the breeze. Hopefully it will be warmer, and we will be seeing more of the sun. In this part of the country, we are so lucky to be close to the natural world, and its cycle of seasons. We're part of that great cycle, where the mud and fog of winter each year gives way to the longer days and brighter weather of the spring. 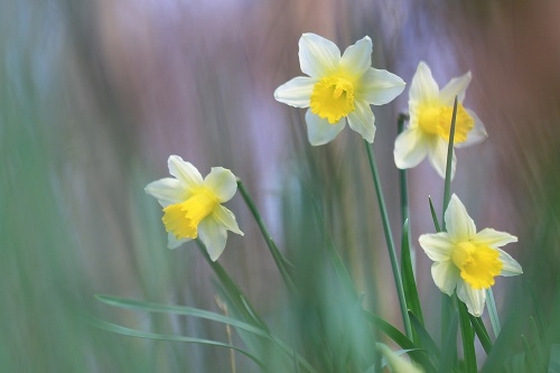 The old name for those little daffodils was 'Lenten lilies', because they flower during the season of Lent -- that time in the church year when we reflect on the dark times in the life of Jesus, and how they relate to our own experiences. And Lent leads to Easter Day, and all the new light, new life and new meaning that the first Easter day brought with it. And so often, that's a pattern which we can see in our own lives too. We go through a dark time of trouble -- of financial worry, family division, bereavement -- and it feels like the dark tunnel we are in will never come to an end. But more often than not, if we keep plodding on, and hoping and trusting, we will find that there is a light in the darkness; something new -- something quite unexpected -- a small resurrection in our own selves. I wish you a safe journey through Lent, and a joyous Easter on April 1st.